One bite. One timid, tentative bite and I wait. I wait for the deadly neurotoxins to wreak havoc on my nervous system, throwing my body into spasms of agony before, hours later, screaming and frothing at the mouth, my internal organs surrender to the inevitable and, one by one, shut down forever. Perhaps could it be worse than that? Maybe there won’t be spasms but just a slow, creeping paralysis. Starting in my toes and, after many anxious days, leaving me a motionless living corpse destined to be bed-ridden for decades, passing the time by blinking out the answers to Sudoku puzzles with my eyelids. Why am I so fearful? After all, I have eaten street food in places as diverse as Bali (where I’m pretty sure the dishes were “washed” in the “stream” that ran along the road beside the cart), to Ramallah (take-away falafel in the back of an armoured SUV). Wild mushrooms, it seems, are my limit; a kind of fungal Rubicon I dare not cross. I am no culinary Caesar. Until now. Another bite. Nothing. L and the 17-year-old Gaping Maw who lives in our basement are munching away happily with no ill-effect. I relax a little and eat some more. Fear begins to fade. I wonder why I waited so long. Every year in late summer giant white puffballs emerge overnight in our little patch of woods by the lake. And every year I promise myself I will pick one and cook it and eat it. But some deep-rooted, atavistic fear always prevents me. Until now. 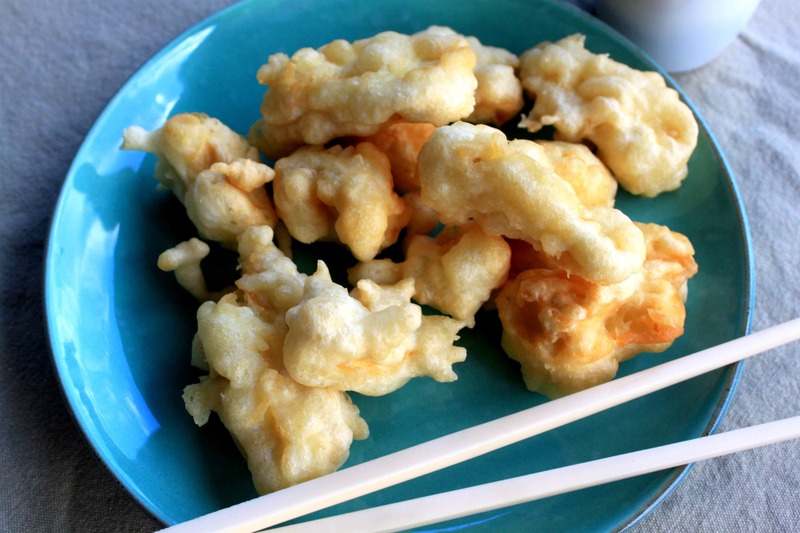 I take a large, fearless swallow of puffball, perfectly done in tempura. It’s not really what I had expected – a little nutty, a texture more like cheese or tofu than mushroom. It’s good. “It’s good,” I say with relief. I feel liberated. I feel like chucking away our urban life and moving back to the land where we will survive on puffballs and bears I have skinned myself. I am very proud. L puts down her fork and stares at me for a long minute. I look over at the Gaping Maw, who has cleaned his plate as well as the entire plate of tempura shrimp that was supposed to be for all of us. Oh well, everyone is enjoying the food and I have finally put my fear of wild mushrooms behind me forever. “I think I can feel a tingling in my toes,” I say, putting my own fork down. Mix baking soda with flour and then mix dry ingredients into ice water. Do not over mix; a few lumps are fine. To cook, in a large Dutch oven or heavy pot, preheat 3-4 inches of canola or vegetable oil to 375 F. Coat vegetable strips, mushrooms, or shrimp in the batter and fry until lightly golden (about 2-4 minutes). If using giant puffballs, cut into strips of about one-inch circumference before coating with batter. Good luck. 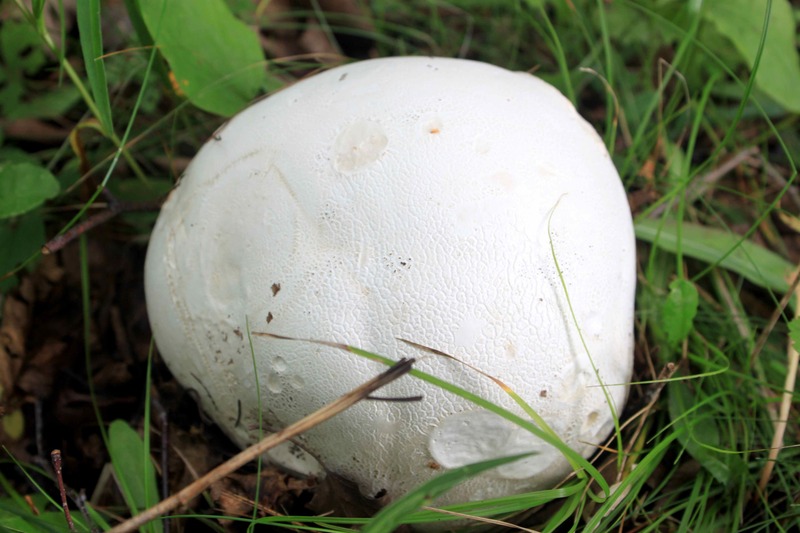 To learn more about safely identifying and using giant puffballs visit here for further information. Are you dead yet? I hear puffballs only kill the males species. Gaping Maw’s are usually well vaccinated for everything up to the age of 18. And mothers never get sick and die. They just don’t have time. Mmmm I had some last week for the first time – good tasty stuff. Didn’t tempura it though. Will next time. Along with a Mars bar. Thanks. Keep meaning to try that Mars bar thing! A nice simple way to cook these Calvatia gigantea is to sauté slices in olive oil, and sprinkle on some grated Romano cheese.